When you step into your bathroom late on a Saturday night and discover a clogged toilet overflowing and staining your carpets and walls, will you idly wait until Monday for a sloppy repairman to finally make time to fix it? Or will you call the highest qualified emergency plumber in Orlando for a prompt reliable response? Night or day, A1 Service Plumbing is available around the clock to provide immediate repairs to the most untimely plumbing mishaps. No matter what leaks, clogs, blocks, or bursts, we are standing by 24 hours a day and 7 days a week to ensure that our customers live in the comfort and reassurance of dependable care. No project or repair is too large or small to expect the utmost in workmanship and timely service. Respect and consideration for our customers are what keeps A1 Service Plumbing as one of the most highly regarded emergency plumbers in Orlando. 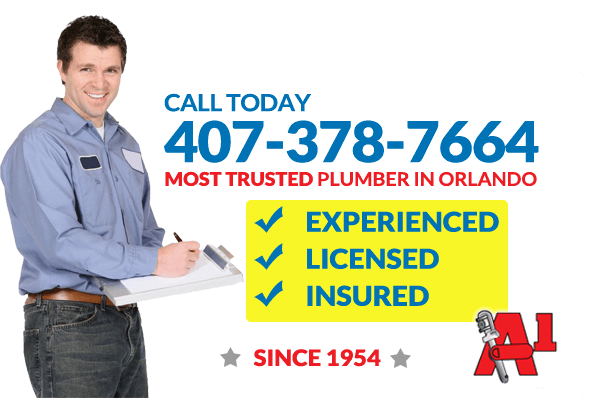 As the premier available Orlando emergency plumber, our customers enjoy top grade quality and swift competent service at the best affordable price. In addition to numerous accreditations and positive testimonials, we are proud to maintain an A+ rating with the Better Business Bureau. We are fully licensed and insured, prepared to stand behind the quality of our workmanship with a guarantee of satisfaction. For decades, principal owner, Mike Macherone Sr, has led the company with integrity, precision, and professionalism. The uncompromised priority of excellent customer service has cultivated A1 Service Plumbing from the small humble shop of its opening in 1954 to today’s fully staffed facility of over 8,000 square feet. Residential and commercial properties alike often require the timely response of a skilled Orlando emergency plumber. Our technicians are trained and certified to work on any make or model, and we back the manufacturer’s warranty with our own supplemental warranty. Major projects like repiping are begun with a detailed written analysis and a complete estimate of the necessary costs, so customers are informed and prepared for every step of the process. Unexpected repairs, routine maintenance, and precise installations are available throughout the area at the possible prices. No one should have to live with the inconvenience of faulty plumbing or the stress of waiting on an incompetent handyman. Protect your home or business from the risk of burst pipes or backed septic tanks that can damage property and increase water bills. Call today for an Orlando 24 hour plumber that will get the job done.